After seven months of organizing and preparation, we are happy to announce that our first live, international, family-to-family dialogue successfully took place today at the Anacostia Library in Washington D.C. 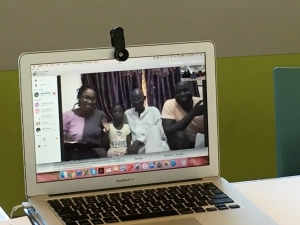 The dialogue connected members of two American families in D.C. — a grandmother and her grandson, and a father and his two daughters — with a nine-member family in Dakar, the capital of Senegal, located on the coast at the western-most tip of Africa. After introducing themselves, the families freely asked each other questions about their use of media (Facebook, Youtube, Snapchat, etc. ), their food, music, modes of transportation, and cost of living, among other subjects. As the American families learned, residents of Dakar are not that different from residents of Washington D.C. as fellow major city dwellers connected to common media, music, food and other goods. This dialogue was the first in a series of pilot dialogues Learning Life has planned over the next few months between American families in Washington D.C. and families in El Salvador, Senegal, and Jordan. 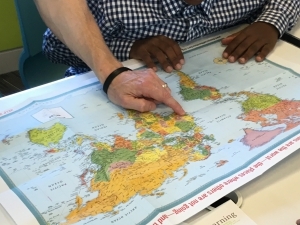 Working with a resourceful team of volunteers and student interns, Learning Life began building this Citizen Diplomacy Initiative (CDI) from scratch in late January 2016, and has since found partners and families in Washington D.C. and these four nations across the world. In addition, to enable the families to communicate with each other in their respective languages, we have recruited volunteer interpreters and a set of common documents (surveys, dialogue guides, country info sheets, etc.) in the four different languages the families speak: English, Spanish, French, and Arabic. Our purpose in building CDI is to tap into the power of the internet to nurture international peace and youth development. Our world is clearly globalizing (see our Five Ways World Affairs Affect Us All), but transnational travel is still too costly for many of the world’s people. Moreover, tourism is not necessarily educational, and the use of “virtual exchange” (dialogue via the internet) for educational and cultural enrichment is too often limited to universities. 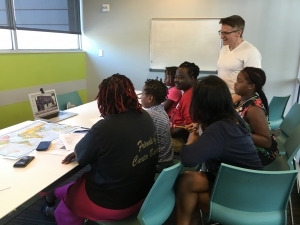 In pursuit of our mission to spread learning in everyday life beyond school walls, CDI connects families rather than schools as a way to make international affairs approachable to more people. We also focus on families that have less money and fewer educational and travel experiences in order to help address deepening inequalities and extent opportunity to more people. And, we do so free of charge to our participating families. In the coming months, we will keep you posted as the dialogues progress, and we move toward a first international collaboration between the children involved in the dialogues. Stay tuned! To support Learning Life’s Citizen Diplomacy Initiative, please make a donation here. To volunteer, please visit our CDI page to learn about the various ways you can get involved, then contact us at email@learninglife.info to set up a phone meeting. Thanks to Learning Life volunteers Emilie Mondon-Konan, Derrick Costa and Samantha Macfarlane for respectively helping with French-English interpreting, photo and video recording, and organizing of the dialogue on the Senegalese side.